Mayor Geoffrey Dawe is not going to rest on his laurels. The Mayor officially announced his bid for re-election at Wednesday’s annual Mayor’s Luncheon hosted by the Aurora Chamber of Commerce at King’s Riding Golf Club. Having officially signed his papers at Town Hall earlier that morning, he announced his intentions after a speech focusing on the achievements of the current term of Council over the last three years. 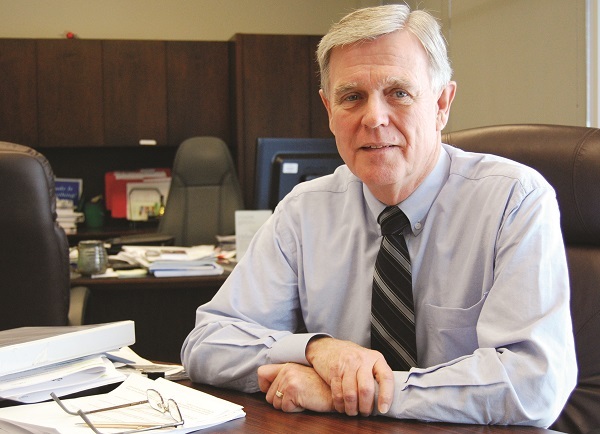 “These past three years have been quite a whirlwind,” Mayor Dawe told an audience of business leaders, Chamber members, and politicians from both Aurora and Newmarket, including MP Lois Brown. “To borrow from the American Peace Corps, it is truly one of the toughest jobs I have ever loved and it has been my pleasure and honour to serve our residents. Aurora, he said, has been “better off on all counts,” but life has taught him never to “rest on his laurels.” There are still “strong challenges” ahead, he added, noting now was not a time the Town could afford “a return to the short-term thinking and political expedience” that has characterized some past governance. The Mayor’s address, however, was not merely the first of a campaign stump speech, but outlined the growth and changing face of the Aurora business community over the last 12 months. A successful organization, he said, is contingent on the expertise of the people who are a part of it. He said he has emphasised the expertise of staff at Town Hall to get things done, be innovative and “maximise effectiveness” in facing the “realities and challenges” of a growing urban municipality. Reactive policies elsewhere, such as zero tax increases in municipalities like Mississauga, and indeed Aurora in the latter half of the 1990s, provide a blueprint of what not to do, he said, highlighting the importance of making sure organizations such as the municipality have healthy reserves to keep going. But that is a partnership with the taxpayers. They need to be assured hard-earned tax dollars are being spent “appropriately” and they are getting good value for their money. A service level review, he said, has provided a “dispassionate” assessment of whether that is indeed the case. Looking ahead to the 2014 budget, which was hammered out on Monday for final approval early next month, he said he was proud of the budget record in providing for key services like the Central York Fire Services, Aurora Public Library, as well as the continued renovations to the Aurora Family Leisure Complex to create a “youth centre” after 17 years of surveys, studies, meetings, open houses and indecision. “It is the direct result of the type of engagement and policy creation of a positive, collaborative atmosphere in Town Hall,” he said.